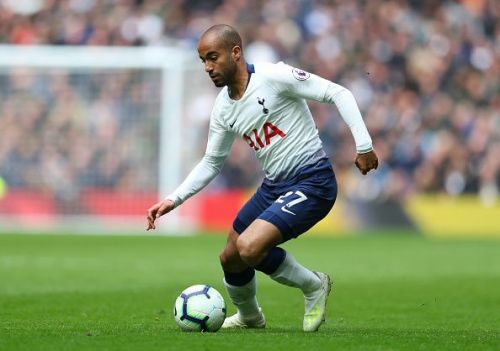 Spur's Brazilian winger, Lucas Moura, was in top-form as Tottenham coasted past Huddersfield with a 4-0 win. Moura hasn't been a regular fixture in this Spurs team owing to injury and a dip in form, but his performance against Huddersfield displayed just how talented the Brazilian is. Spurs' fans were sceptical about how the team would adapt in their new stadium, considering they took a considerable amount of time to get going at the Wembley stadium. But since the inaugural game in their new stadium at the beginning of April, Spurs have a 100% success record with wins against Crystal Palace, Manchester City and now Huddersfield Town. Moura's hattrick is the first by any player in the new stadium and the former PSG player made it one to remember. He scored his first in the 27th minute after Moussa Sissoko found Moura in the box with a clever pass. Then, the Brazilian scored with a brilliant finish depositing the ball in the bottom left corner. Moura took almost an hour to score his second goal of the game and it came when Christian Eriksen did what he does best and accurately found Moura inside the box with one of his trademark pin-point crosses. Moura comfortably scored his second. his hattrick came just three minutes later and his third was arguably the best of the game. Heung-Min Son sent Moura on a run with a clever through ball and the Brazilian perfectly timed his run to beat Huddersfield centre-back, Christopher Schindler, to the ball and then scored an absolute blinder from a tight angle. Moura put the ball into the top left corner to wrap up his hattrick and a very impressive 4-0 win. Spurs manager Mauricio Pochettinho will be hoping to use Moura's resurgence in form to lock down a top-four spot and possibly progress to the Champions League semi-finals. With the North-London club, all set to defend their 1-0 lead against Manchester City in the Champions League Quarter-Final tonight, Moura will be hoping to come good. Moura has a power ranking score of 20.1 and his hattrick takes his Premier League goal tally to 10 for the season. With this great performance under his belt, Lucas Moura is the Premier League Player of the week. Will Huddersfield Town Return Quickly To The Premier League? Gonzalo Higuain and Eden Hazard: The beginning of a love affair at Stamford Bridge?